Every day after school, a car pulls up in front of TheZe DealZ — a west Dayton thrift store — and a 16-year-old girl pops out. She runs inside, gives owner Zontaye Richardson a hug and returns to her waiting mother. In its short life, the thrift shop has become much more than a place to buy used sweaters, coats and shoes. It has become a community nerve center, a place to socialize, network and pitch in to help neighbors in need. And thanks to Richardson – known affectionately as Miss Z – it resonates with teenagers. The thrift store is filled with racks of coats, sweaters and baby clothes — from tiny pink dresses to black fleece jackets to gray sweats. The shelves are stocked with hats, belts and purses. Shoe offerings range from brown loafers to red sneakers. Every customer who walks into the shop is greeted by Richardson, whose friendliness is like a warm blanket. The customers respond in kind. 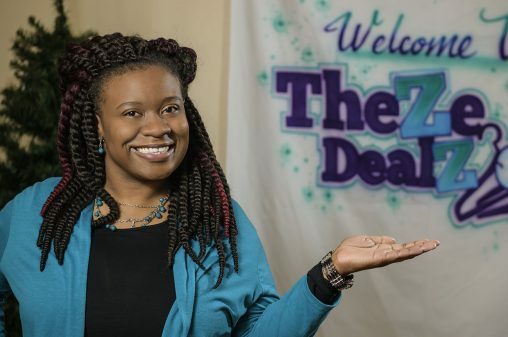 TheZe DealZ has become a community engine for giving. The store recently hosted a Breast Cancer Pampering Party for breast cancer survivors, one of whom was an 10-year-old girl. The survivors first had their hair done at a beauty salon and then came to the store, where they had manicures, makeup sessions, massages, were professionally photographed and received gift cards to the thrift store. “It was a great day, a celebration,” Richardson said. The store also hosted a fashion show in which the proceeds went to Jeannette’s House of Hope, a home for pregnant teenagers. The event featured 27 models who paraded down a runway dressed in TheZe DealZ clothing before about 60 attendees. Zontaye Richardson has held community clothing giveaways, passing out coats and other donated clothing at her church and to children who live in low-income housing. Richardson has also done community clothing giveaways, passing out coats and other donated clothing at her church and to children who live in low-income housing. She also opens her store to other people in the community to come in and sell their products. “We had someone who does knitting and crocheting selling some of her hats and gloves and scarves,” she said. On May 25, Richardson will celebrate the one-year anniversary of the thrift store with a variety of giveaways, food and entertainment over three days. Richardson grew up in Dayton and attended Belmont High School, where she ranked third academically in her class. In high school, Richardson became interested in helping children with disabilities. Her stepfather worked in habilitation services, and Richardson came into contact with children with disabilities when she taught Sunday school at her church. At Wright State, Richardson focused on working with adults with disabilities. One of her classes required her to job-shadow, and she did it at the Montgomery County Board of Developmental Disabilities Services. She was later offered a job there and worked while she was a student. 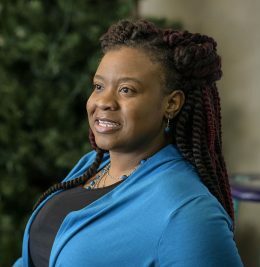 After graduating from Wright State in 2007 with a bachelor’s degree in rehabilitation services, Richardson began working full-time for the agency as an habilitation specialist and job coach and later as a behavior support specialist. Richardson’s younger brother also graduated from Wright State, with a degree in engineering. He currently works at Fuyao Glass America, a Chinese company with a fast-growing Dayton-area plant. Richardson wanted to open her own thrift store and employ workers with disabilities. And when she realized there were no thrift stores in her west Dayton neighborhood, she took classes at the library to learn how to run and market a small business. 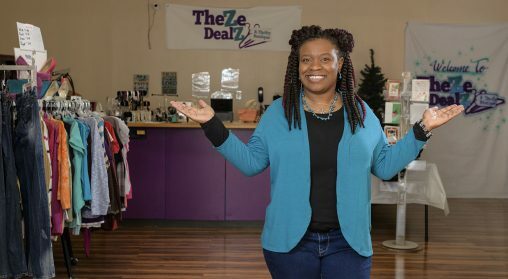 She opened TheZe DealZ (the name is a play on the Z in Zontaye) in May 2017. Richardson currently has two part-time employees and plans to begin hiring workers with disabilities soon. Customers frequently volunteer to help out at the store, and Richardson offers volunteer hours for youth to help teach them job skills. Richardson graduated from Wright State in 2007 with a bachelor’s degree in rehabilitation services. The store attracts customers from as far away as Troy, a 25-mile drive. Richardson says TheZe DealZ is “most definitely” more than a clothing store.